Are you looking for a new hair stylist? Maybe you just moved to town, or perhaps you’re unhappy with your current salon and ready to make a change. Whatever the reason, the first step to finding a new stylist is to ask friends, neighbors, and co-workers for suggestions. If you see a random stranger with a great haircut, compliment them and ask for the name of their salon. You’ll make them feel good and have a solid lead! Whatever you do, make sure you answer the 8 questions listed below before you let someone new cut, color or style the hair on your head. Many hair salons describe their products and services on their websites and Facebook pages. If you visit the different sites you’ll learn what they do best. Maybe you’re thinking about ombre highlights or coloring your hair for the very first time. If so, you’ll want to find a salon that specializes in comprehensive color and dye jobs. When you look at our website, you learn Beautiful Grace hair salon can give you any style you want from crazy colors to a warm conventional brown. We explain why we’re experts in comprehensive color and dye jobs. FYI: Beyond hair coloring, we excel at precision cuts, styles and hair care. We even have expert makeup artists for weddings and other special events. An online search is a quick way to create a list of nearby salons that offer the products and services you want. 2. How Much Training and Experience? Every state requires hair stylists to be legally licensed to provide services. The license requires completion of a state-approved program. You may want to ask where your hairdresser went to school. Different programs have different reputations. Find out how long the stylist has been working professionally. Ask if he/she is a colorist or curly hair specialist, which requires additional training. Does your stylist participate in continuing education to stay current on the latest techniques and trends? You may find the answers to these questions in an online bio for your stylist. If not, ask when you meet in person. 3. What Will Your Hair Styling Cost? Many salons list the cost of their services on their website. This helps you decide if the price fits your budget. If no prices are shown online, then call and ask. Stylists with more experience and training will cost more than a newly licensed stylist. There are three levels of stylists: junior, senior and master. A master stylist can cost 15-20% more than a junior stylist. Some salons offer deals to new customers and referrals. It never hurts to ask if there is a discount, especially if you’re considering multiple services in one visit. Don’t forget to check social media for sales. 4. Do You Have Compatible Schedules? The best stylist is no good to you if you can’t schedule an appointment at a time that works for you. Check salon hours to see if they match your needs. Many salons stay open past 5:00 pm to accommodate clients who work all day. 5. Do Clients Recommend the Hair Stylist? Beyond word of mouth recommendations, you can visit Facebook, Google and Yelp reviews for a stylist or a salon to view comments posted by clients. You’ll quickly see if customers are satisfied. It’s a good idea to throw out the best and worst review; average the rest together for a realistic assessment of the salon and stylist. You can sort the comments by date to see what the most recent customers have to say. It’s fun to look for reviews on Facebook because clients often post photos of their new hairdos. You can read reviews and see samples of the stylist’s work. 6. What is in the Portfolio? You need to look at a stylist’s performance before you let them work on you. Often, a hair stylist’s portfolio can be found in their website hairstyle gallery or Facebook reviews. Take some time to look at your potential stylist’s work online. Do you like what you see? If every style is purple and pink, and that’s not for you, you’ll know to keep looking. When you visit the salon look at other clients. This is your chance to look at the actual work. 7. What’s the Salon Vibe? You’ll have to visit in person to answer this question. Is the salon clean? Are there enough sinks and chairs? What’s the overall vibe? Do you think you would be comfortable there? Is the atmosphere casual or high-end fancy? Are the employees and clients happy and engaged in conversation, or is the mood serious? Which do you prefer? Individually owned salons, like Beautiful Grace, are more personalized than a franchise or chain store. Local business owners care about their community and are invested in your satisfaction. After you’ve exhausted your online research, it’s time to meet the hair stylist or stylists who made your list. Call and make an appointment for a consultation. If that sounds too serious, schedule a blowout or trim. The goal is to meet in person to see if you are compatible. Feel free to tell the stylist you’re trying to choose a new salon, and let him/her impress you. A 15-minute meeting should give you and your stylist enough time to determine if you’ll work well together. Talk about your specific hair. Ask what style is best for your face shape. If your hair is super thick, thin or curly, get recommendations on the best way to manage it. Be honest about how much time you’re willing to spend on your hair. It will help the stylist give you practical advice. If you color your hair, ask the stylist which color is best for your skin tone. Find out which products work best with your type of hair. Ask if you’ll be able to maintain the color at home between visits. After you discuss your specific needs, ask a few questions about the stylist and salon. Note if the stylist is well groomed. How is his/her hair? It’s hard to trust your hair to stylists who don’t take care of their own. After your time together you should be ready to decide if this is your new hair stylist. No one likes it, but sometimes you have to break up with your stylist. 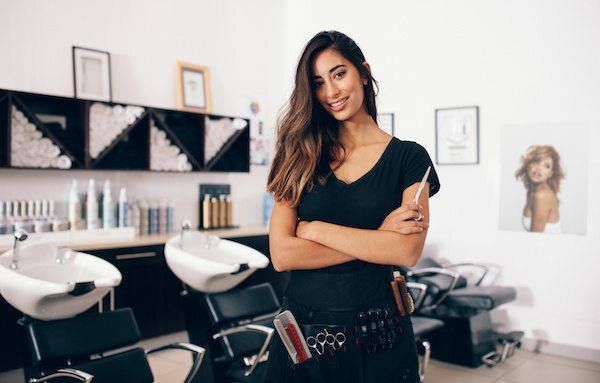 We’re confident that once you’ve answered these 8 questions you’ll be ready to choose your new hair stylist. Call us today at 832-412-1956 for answers to any of your questions. We’d love to help you with your hair color, cut, style and more!